Pathology of the parathyroid glands is fairly prevalent in the United States. Each year, approximately ten cases of primary hyperparathyroidism (HPT) per 100,000 people are diagnosed in those younger than 40 years. The incidence is estimated to be four times higher in patients older than 60 years of age . Surgery for primary HPT, performed by an experienced surgeon, is curative in more than 95% of cases . In contrast, the success rate for low-volume surgeons is only 70% . 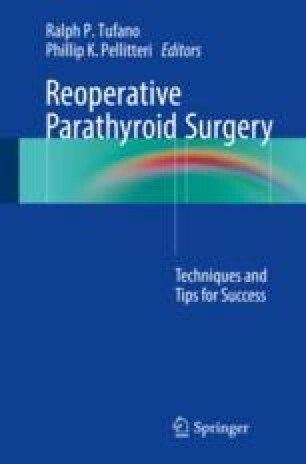 Consequently, the hyperparathyroid state may not be cured for a number of patients following surgery. Those not cured either remain hypercalcemic in the immediate postoperative period or redevelop hypercalcemia after a period of normocalcemia. Hypercalcemia persisting or recurring within 6 months after initial parathyroidectomy is referred to as persistent HPT. Hypercalcemia recurring more than 6 months after an apparently curative initial parathyroidectomy is referred to as recurrent HPT. Regardless of terminology, in both cases, the patient is at continued risk of metabolic complications from hypercalcemia and may continue to have discomfort from the associated symptoms. Despite advances in preoperative imaging and adjunctive intraoperative tools, the incidence of persistent or recurrent HPT has been reported to be as high as 30% [4–6].